March 16, 2014 FULL MOON Potluck & Bonfire Sun 6-10 pm details. Tour available. RSVP ! April 4, 2014 FIRST FRIDAY Activities will not happen this month and will resume on May 2 ! April 9 2014 Oakland County Permaculture Meetup usually held in Clarkston. Click on link ! April 15th, 2014 FULL MOON Potluck and Bonfire Tuesday 6-10 pm details. Tour available. RSVP ! In this unique class, participants will learnthe history and basics of mushroom cultivation, with a focus on using fresh-cut hardwood logs to grow premium gourmet mushrooms. Participants will learn about what types of logs to use, how to inoculate them with mushroom seeds or spores, and how to care for them, and where to get spores for future mushroom adventures. During this indoor & outdoor class, participants will inoculate a shiitake log to take home (a $35 value), including instructions for basic care and maintenance, and there will be both lecture & hands-on time, including a tour of two mushroom “gardens’ located on the Strawbale Studio property. There will also be spore plugs and growing kits available for sale from Easy Grow Mushrooms, a Michigan-based company. Bring your own bag lunch. $ 75 Early Bird Special – paid by April 10, or $85 thereafter with RSVP (make sure there is room in the class). Class limit of 15 So Register now. April 25- 27, 2014 MI Earth Day Fest ~ Rochester, MI. Free wonderful festival !! The Strawbale Studio will have an exhibit and activities there. A rich experience in local sustainable living. Come for one or both months. Participate in all the workshops below. During this time period we will be starting a foundation, finishing a round pole structure and a rocket stove, using earthen plasters & cob ~ as well as putting in components of a permaculture-inspired gardens: sheet mulching (lazangna gardening) starting seedlings and planting the Living Roof of the Hobbit Sauna. This is a unique opportunity to experience buildings with thatched roofs, and see a demonstration of the process. Strawbale Studio participates in the Permaculture Meetup, hosts the Full Moon Potluck & Bonfire and does educational outreach. Attend for 1 or more months, and take part in all workshops and activities during this time period. Each month is $750 (paid 1 month in advance) or $850 thereafter with RSVP. Limit of 6 Intern, so register now. Includes room, board and all activities. Click on link for more details. Contact Chris McClellan, Natural Cottage Project, 1-440-221-6609 or email: service@maplecom.com, or Deanne Bednar 248 628 1887ecoartdb@gmail.com. Some 1/2 pay worktrade positions may be available. May 2, 2014 FIRST FRIDAY ACTIVITIES at the Strawbale Studio. Check out these 3 events ! VOLUNTEER Crew 1 – 4:30 p . Join with others to help the Strawbale Studio serve by assisting on current projects, grounds or data entry. No charge. Click link to Register. TOUR: Natural Building & Sustainable Living 5p – 6:30 p New Monthly Program ! Get a detailed tour of the Strawbale Studio, Oxford Kids’ Cottage, Smiling Face Earth Oven, Totem Rocket Stove Mass Heater and more. Bring your friends and family. RSVP $10/person suggested donation/ group & family rates. Click link to Register. CRAFT Night 7p – 9:30p Bring your own handiwork to do…whatever ~ mending, fixing, knitting, whittling … plus a snack to share if you wish. No charge. Click link to Register. 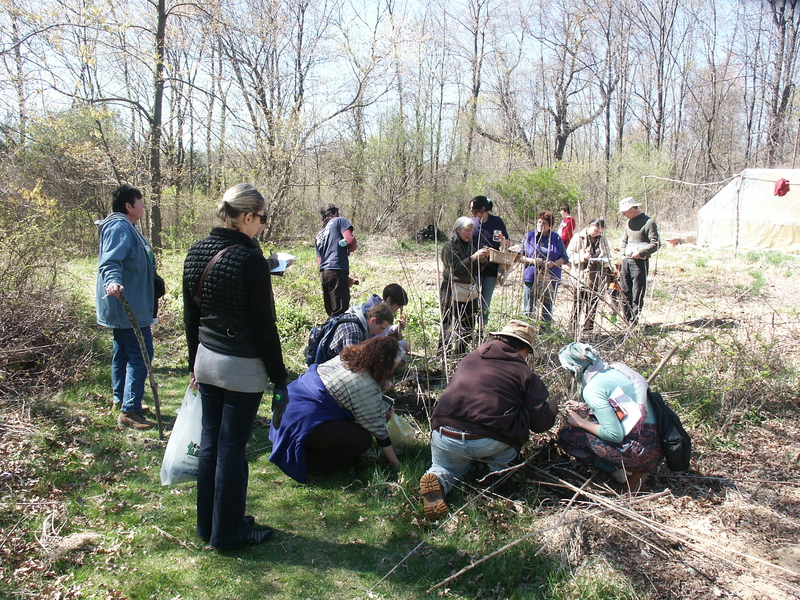 May 14, 2014 Oakland County Permaculture Meetup usually held in the Clarkston area. Click on link ! May 15, 2014 FULL MOON Potluck & Bonfire Thurs 6-10 pm details Tour available. RSVP ! Learn about and harvest Wild Plants that you can eat, and experience a Rocket Cook Stove in action as we cook up a brunch of local eggs & add our wild-harvested plants for an omelet! Wrap it all in Injira Sponge Bread… made from local grains and local yeast (home-made sourdough starter). We will also have some cooked brown rice or quinoa as an alternative to eggs. See the Thatched Roof Structures and Earth Oven on site, and go on a tour of the building and grounds if you wish. Rain or shine. Limit 12, so Register now. 🙂 Early Bird Special $25 prepaid 2 weeks in advance, or $35 with RSVP . May 17, 2014 LIVING ROOF WORKSHOP Saturday 2 -5p Come spend some time at the Strawbale Studio and explore this beautiful roofing option. Learn the principles of construction, see one “wildly successful” living roof on the Wood Shelter, and help plant the roof of the Hobbit Sauna with plants that are foraged from the surrounding land ! Families are welcome. A nice outing ! $20 if prepaid 2 weeks in advance. $30 thereafter with RSVP ! May 24, 2014 FIRE & HEAT ! ROCKET STOVE and more ! Saturday 10 a to 5p. Energy efficiency from local materials ! See & experience a Rocket Mass Heater, Rocket Mass Cooker, Hay Box Cooker, Earth Oven & more. Learn the principles of construction. Q & A. Also a tour of the thatched buildings on site. Bring a bag lunch and sample the food we cook together. $40 with RSVP or $25 prepaid 2 weeks in advance. Limited to 12 students. Register now. June 6, 2014 FIRST FRIDAY ACTIVITIES at the Strawbale Studio. Check out these 3 events ! Learn the principles of thatching a roof, harvesting materials, tour thatched buildings, see a demonstration and try your hand at the basics. We will also watch a video on thatching. Bring a bag lunch. $40 with RSVP or $25 prepaid 2 weeks in advance. Limited to 12 students. Click on link for Registration or any questions. June 13, 2014 FULL MOON Potluck & Bonfire Friday 6-10 pm details Tour available. RSVP ! Try your hand at using natural and local soil to make earth plaster and sculpting. Make your existing home more natural by applying earth over existing walls, or apply these skills to a future natural building or earth oven you construct. Make a model of a small structure or sculpture. Bring a bag lunch. $40 with RSVP or $25 prepaid 2 weeks in advance. Limited to 12 students. Register now ! Come and help prepare for and participate in a very comprehensive and intensive 2 week building course below. $750 (paid 1 month in advance) or $850 thereafter with RSVP. Limit of 6 Intern, so register now. Includes room, board and all activities. Click on link for more details. Contact Chris McClellan, Natural Cottage Project, 1-440-221-6609 or email: service@maplecom.com. July 12, 2014 FULL MOON Potluck & Bonfire Saturday 6-10 pm details Tour available. RSVP ! This is the main event of the year ! This two week course with 3 seasoned instructors is one of the most inclusive workshops available ! Stone foundation, Strawbale and Cob Wall Systems, Round Framing basics, Round Pole Framing and Thatching. Pre-register now to save your place ! More info to come. Contact Chris McClellan, Natural Cottage Project, 1-440-221-6609 or email: service@maplecom.com. Click on above link for details and pictures of previous projects ! August 10, 2014 FULL MOON Potluck & Bonfire Friday 6-10 pm details Tour available. RSVP ! August 16th, 2014 HAND PAPER-MAKING & Berry Inks Class with Dana Driscoll. 10a – 4p. (Rain Date August 17th.) Join us for a natural art-filled day at the Strawbale Studio where we create sustainable art supplies from natural materials! Learn how to make handmade paper using locally-gathered cattail fibers and create inks from in-season berries in this exciting class. Dana Driscoll, who has over 15 years of hand papermaking experience, will cover a brief history of papermaking, teach the principles and demonstrate how to make beautiful pieces of cattail fiber paper. Each student will have the opportunity to make their own cattail paper to take home with them and understand what materials they will need to continue making paper from home. Additionally, students will learn how to make their own berry inks for writing, drawing, or other kinds of artwork. We’ll discuss ink creation, berries and available colors, preservation, permanence, and different ways to use these delightful inks. Arrive 9:45 – 10:am. Class will begin promptly at 10am. Please bring a bag lunch. Class limit 15, so Register now. Payment confirms your place. $25 prepaid 2 weeks in advance, $35 thereafter with RSVP. Come for a month, or more and participate in all activities and classes during that time. Included will be earth plastering, cob, round pole construction, thatching and many other aspects of natural and sustainable living. Click on the link for more information ! August 10, 2014 FULL MOON Potluck & Bonfire Sunday 6-10 pm details Tour available. RSVP ! FALL 2014 BUILDING the COB COTTAGE. 2 week course. Pre-register now to save your place ! More info to come. Jan 4 – Feb 4, 2015 WINTERNSHIP ! Participate in all workshops during this time : Rocket Stove, Round Pole framing, Reed Collection & Thatching demo, while helping with sustainable living projects at the Strawbale Studio. Click on link for details & application form. Program will be similar to 2014. Details to come. Internship $750 prepaid 1 month in advance or $850 thereafter with RSVP. Several Worktrade positions available at half fee ($375/$425). Worktraders help out with infrastructure 10 per week ( firewood and grounds, cooking & cleaning, office work & publicity). Participate in all other activities. Limited openings. Christina Keegan writes: “I highly recommend this natural building internship opportunity to anyone. I did this last year and am so grateful for the experience. It’s only one month, very affordable, and you get to live with and learn from one of the best natural builders around. In addition, the activities are chosen based on the interests and learning goals of the participants, and Deanne makes sure to create an egalitarian environment in which everyone learns from and supports each other. “ See Christina’s memories of her experience ’12 – WOOFing at the Strawbale Studio (72 photos).